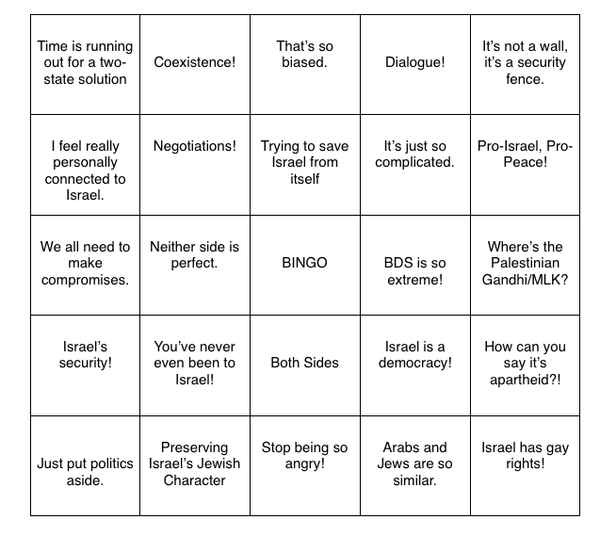 And now, in addition to the thrilling, educational Hasbara Bingo, there’s Lib Zio Bingo! These games are essential training for playing Spot the Lib Zio, discerning if hasbara is deployed as well. Here’s a couple more lib zio sayings that have floated past my view recently. Some incorporate hasbara cookbook recommendations as well. “Collective rights trump individual rights”. For more Lib Zio tell tale permutations, follow @libzionistssay on twitter. I’ll try to update with more pithy sayings as they come to hand. Laughable hasbara article about hasbara. Sorry, Pfeffer, hasbara is a mixture of selective facts and lies, and you demonstrate this well. Those who concoct the hasbara – the Reut Institute, the David Project, the IDF spokesperson’s office etc – don’t necessarily believe it. They deliberate fix their message as a response to the message and actions they erroneously perceive their adversaries employing – as many marketers do. Their aim is to sell a horribly faulty product, to outcompete their competitors, who don’t need to sell human rights, justice and freedom as they sell themselves. Then the noxious propaganda is proliferated by its true believers. Zionism was addicted to hasbara from the first – Herzl was the first hasbaroid, spinning the antisemitic message that Jews couldn’t live anywhere in the world safely except in their own ethnosupremacist entity. The volkish myths of ‘redeeming’ the past, the myth of the ‘jewish people’ spun into zionism are other examples of the syncretism of zionism. Fascist ideology syncretises – and zionism won’t stop its habit because the habit is intrinsic to the ideology. 1) Israel is a warmonger. 2) Attacking Iran is madness. 3) Ahmadinejad is not a reincarnation of Hitler. 4) 2012 is not 1938. 5) (Most interesting this one) Iraq was a war for Israel. 6) Neocons are the pits. 7) Australia’s key foreign policy task should be talking the US out of war with Iran. Right, now let’s see where he goes from here. Carr Doctrine So Far 2 – Seems Carr is already put to the test with the situation of David Levick, sought by the US for breaching its Iran sanctions. I consider Carr as an imperialist and doubt he will stand up to the US on behalf of Australian citizens. He certainly hasn’t so far with Julian Assange.